Take Rt 94 South (exit 73) toward Lisbon. Take circle 3/4 around to Rt 144 East which is Frederick Road. Proceed 2 miles. 15095 Frederick Road will be on the right hand side. Turn right into the trailer lot. Take Rt 97 South (exit 76) toward Olney. After 0.7 miles, turn right onto Rt 144 West which is Frederick Road. Proceed 1.3 miles and 15095 Frederick Road will be on the left hand side. Turn left into the trailer lot. Choose your fastest route to Rt 97 Georgia Avenue. Go 7.5 miles once you pass Sunshine (where 650 New Hampshire Ave and 97 Georgia intersect). Turn left onto Rt 144 West which is Frederick Road (if you reach I-70 you have gone too far). Proceed 1.3 miles and 15095 Frederick Road will be on the left hand side. Turn left into the trailer lot. Take New Hampshire Avenue Exit North. Go about 9 miles. 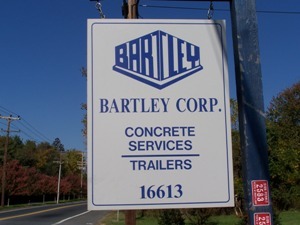 Look for the Bartley Corporation sign on the left. Proceed down the hill. Take Rt. 97 South about 7 miles. Turn left on 650 – New Hampshire Avenue. Proceed another 7 to 8 miles, and look for the Bartley Corporation sign on the left. Proceed down the hill.